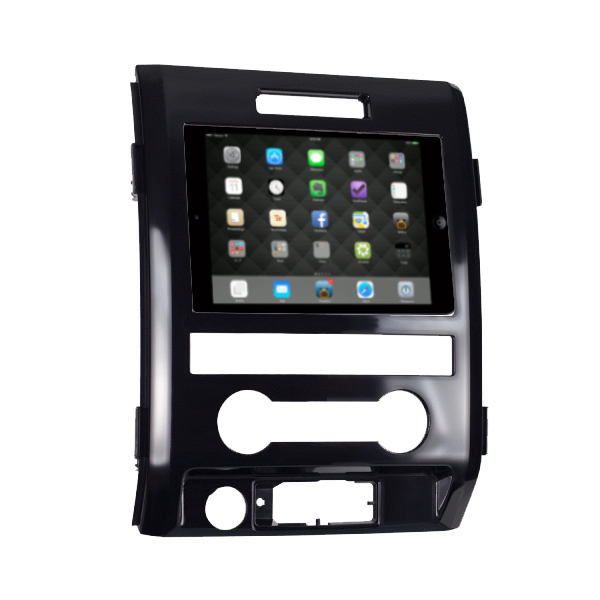 •The iPad Mini & Nexus 7 Dash kit goes right over the factory radio and is installed in SECONDS!. 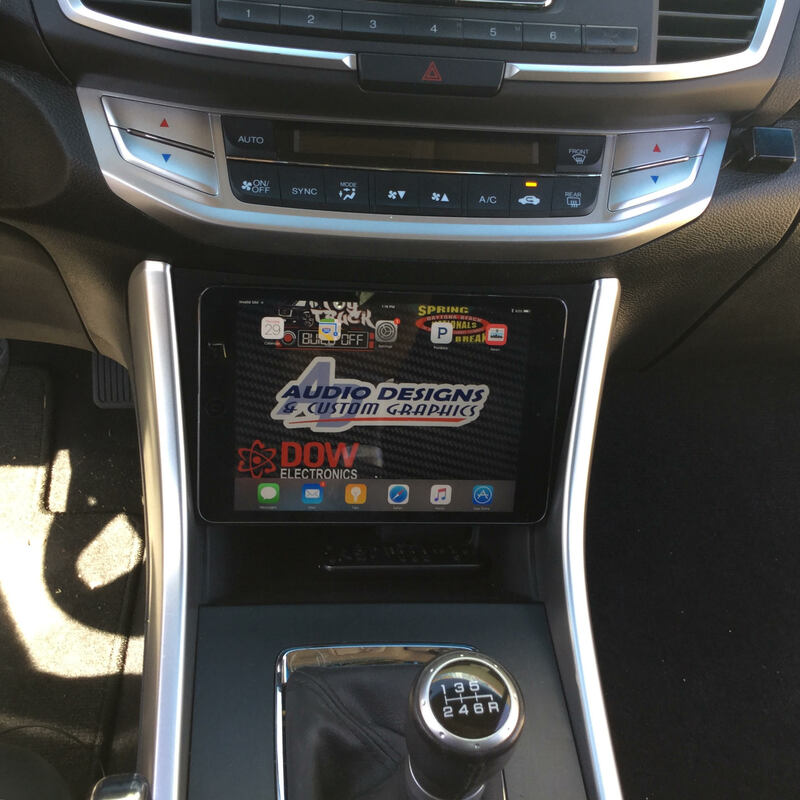 •The iPad Mini & Nexus 7 Dash connects your tablet to the factory system via Bluetooth and allows you to use the factory radio’s volume controls and steering wheel controls. •If you do not have Sync, or have sync and would like to retain the Bluetooth for cell phone, you can simply buy a Bluetooth to aux adapter that plugs in your aux jack in the center console and charges via USB on our site for $39.99 and Bluetooth from the iPad to your aux in. We take great pride in the materials we use, as well as our production process. Each kit is made of a high quality aircraft grade acrylic. They are then sprayed with a color matched automotive paint, and each kit is hand inspected for any inconsistency or flaws in finish. So, rest assured, when your kit arrives, you know it’s PERFECT! **Absolutely no modifications are done to the factory radio so everything is completely reversible. You may ask why so many start? 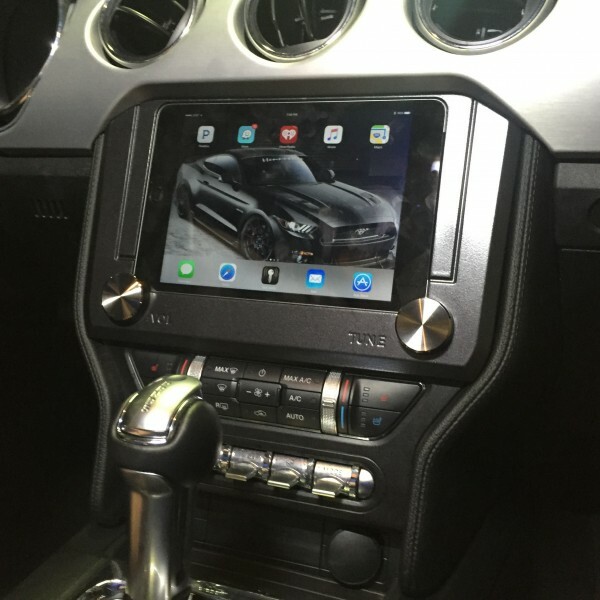 Well let me see, for me I have a 2016 mustang v6 with the regular radio, not the screen, if you want the sync with the screen you have to pay 3,000 or more just for the screen a lone no navigation,no extra cool things, with this kit that it will save you money!! You can have a iPad mini, like a call a iPhone but bigger, and you can used all this apps!!!! Like Google maps, Spotify,, Pandora, you can even get text and calls if you have multiple apple products, so for me I will super highly recommend this kit , if you see the pics you might think is a cheap plastic that will fall, that what i was thinking, but this thing is super hard like wood or something, and the installation is super easy just removed the volume and tune buttons and you done. For me all I’m missing is the wifi camera so you can see it Through the iPad It’s really cool! So don’t even Waste your time Just get it!!!! Thank you for your purchase! Glad you are enjoying it. We manufacture your kit out of Acrylic so it is extremely durable. 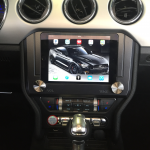 This “ipad mini dash” makes my car’s inerior look like a different car. It just fits right in. And the material that is made out of is very high quality to the touch. It looks great and to be honest I couldn’t be happier with the product. 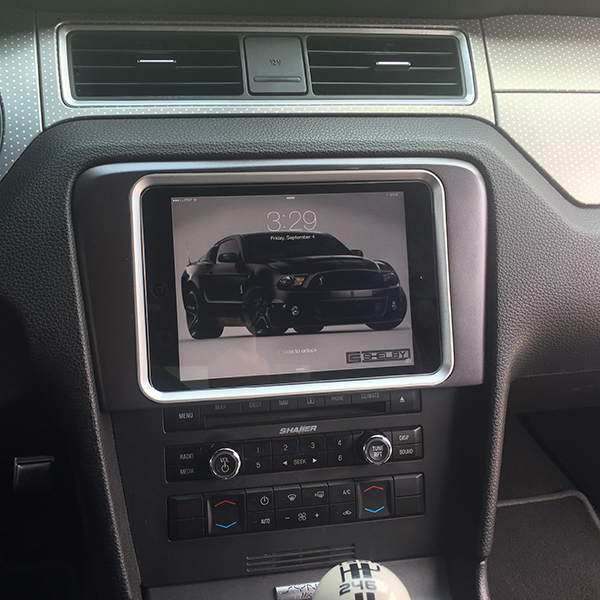 I drive a 2015 mustang gt with the stock tiny screen and now I have this massive screen and thanks to these guys I am now able to show it off. Before, people would get in my car and try and touch the small screen and then they would always ask “this isn’t touch?” And I would always have to say “nope” and come up with an excuse. Now I can be proud of it thanks to these guys. I already guided a couple of friends to getting this kit. Definitely 5 out of 5 starts all around. does it link to my back up camera, can i still control the music witht the wheel, and how does music/ bluetooth/ wifi work? Yes, we sell a wifi transmitter that will transmit your factory camera right on your tablet. If you stream your music via Bluetooth, it’ll allow you to do volume up/down and track forward and back by the steering wheel controls. I’d suggest buying a tablet with a cellular data plan but if you have a tablet with wifi only, you can teather it to your phone as long as your phone has a data plan. Unfortunately the iPad mini is not included. Does the iPad mini fall if you break to hard? I just received my iPad dash kit. I’m very impressed with the quality and how durable it feels. However I’m having trouble with installation. 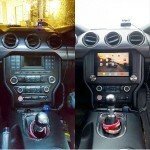 I have V6 mustang with the stock radio and I am having a hard time pulling out the knobs in order to install the kit. Any extra information you may have? Glad to hear you’re happy with the quality of our product! We take pride in our work. Okay, so to get your knobs off you’ve got to put just a little back into it. They pull straight off; no turning and no angle. If that’s not working for you, give us a call, and we’ll see what we can do. Thanks for being the best part of our team! The correct knobs will be to us this month. They will then be shipped immediately @ no charge to you. Thank you for your patience. We’re glad to hear you’re happy with your purchase! The team at Audio Designs does everything they can to make sure the client is happy. 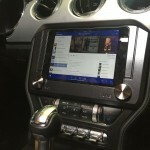 They did a custom job for me and they worked diligently designing a couple of different bezels to fit my tablet. Their goal is alway as happy customer and Kevin & Darren take care of their customers. Thank you for the opportunity to serve you. We strive to put our customers first day in and day out. We look forward to earning your business again in the future! Can you charge the mini ipad while its replaced in the dash kit? Fits great, waiting on the knobs now for a few weeks. Small mix up at first on their end, they owned it immediately and now no response. Otherwise seems to be a good product, just can’t use it. There has been a major delay on getting the knobs out. You are not the only customer that has been effected, and we do apologize. 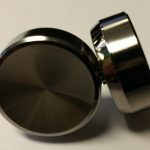 The new knobs will be shipping today. Thanks for your patience. No, the tablet is not included with any of our kits. can you still get the radio on the ipad?? 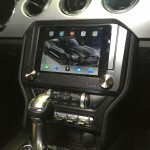 I am interested in buying the dash kit but first want to purchase the right Nexus 7 tablet. I have searched Amazon but the only model number I can find is for the Asus MeMo Pad 7 where the model number begins with ME. Is this the correct one? Great product and looks amazing! What app is used in the video for the back up camer? 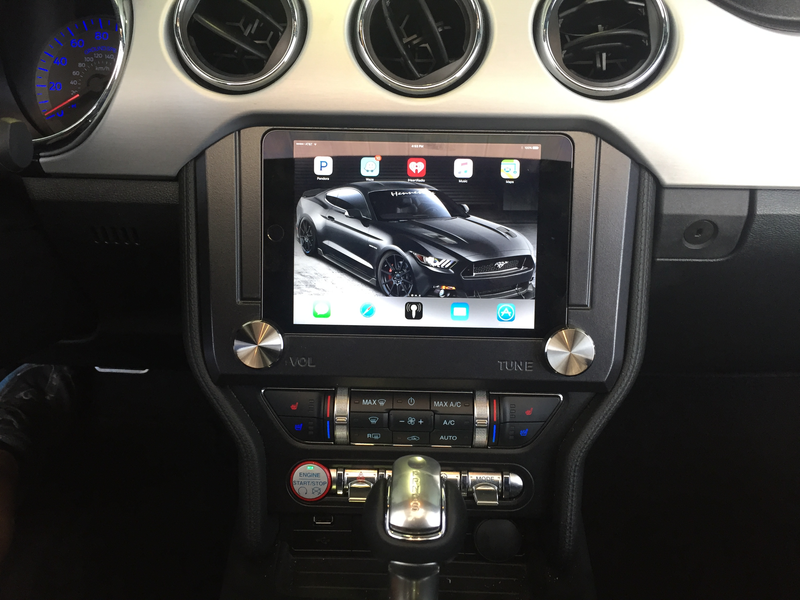 Does the Ipad need to be charged while connected to the dash? It does not need to be charged, however we added a notch out on the back of the kit to allow you to install a charging cable if you would like it to charge while in the kit. This is certainly personal preference, but the iPad mini 4 has been the most popular. Hello, is there also a notch on the Nexus kit to keep the unit plugged in? Thanks, very interested in the unit. Hi, one more question, would any 2nd gen Nexus 7 work? i.e. 41-2B with wi-fi. Keeping my eyes on one on eBay..
Hi, last question, the 4.2″ radio system on the 2017 Mustang seats differently on the dashboard (kind of flash). Does the kit still fit the 2017 model? Thanks a lot for your prompt answers to my questions.